New Approach Signs For Thurles. [From a quote attributed to the Greek philosopher Plato. Picture (1) Erin Foods closed in June 2008. Picture (2) Thurles.ie no longer exists on line. Picture (3) Disk Parking hasn’t existed for years. Picture (4) North Tipperary Co. Council ceased to exist in 2014. It’s a local election year. We know this because new signage shown hereunder has now been unveiled to local sitting Councillors, who met yesterday to formally give their ‘sign of approval’ to the project. Here on thurles.info we had raised the issue of this new required signage back in July 2018; and again, in March 21st, 2019. 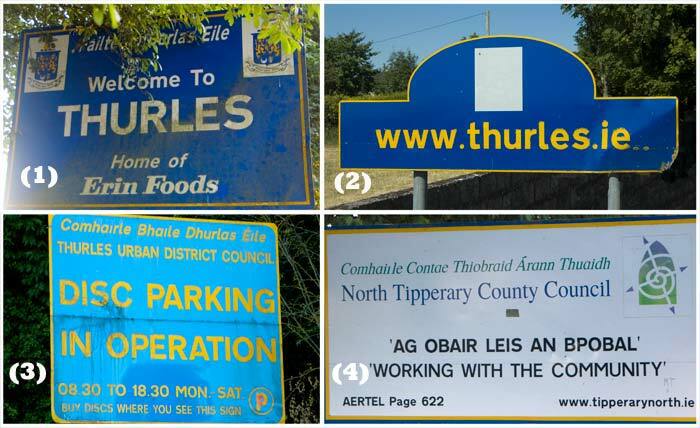 On highlighting this issue, the public realised the 11 years of sheer neglect by our Templemore / Thurles Municipal District councillors, and a brief consultation process was recently began for the redesign of new insignia for Thurles. This announcement, some 11 year too late, was announced on Tipp FM radio yesterday, mainly driven by the need to highlight individuals and party members, all wishing to ingratiate themselves to voters, prior to the upcoming Local Elections on Friday May 24th next. This proposed re-branding was revealed by Ms Caroline Nesbitt of “Designedly”, at a recent Municipal District Council meeting. The simple design shows leaves attached to a branch, latter a continuation of the letter T and includes pictures and text noting the different facets of life in our town, e.g. sport, theatre, education and business. We note the picture specifically highlighting ‘Culture’, namely ‘The Source’ building, was wisely taken at night, thus hiding its ongoing ground floor shabbiness and heavily featured graffiti, not to mention the unkempt overgrown river forefront. Nice job; good exposure. As well as a tree branch and photographs, this new signage also includes the phrase “Fan Tamall linn” meaning “Dwell Awhile”, no mention of the failed, Tipperary –The Place – The Time. Tipperary Co. Council have now regained control of the host name, since the 8th August 2017; for 10 years before renewal again; but almost two years on in 2019, nothing has been done to put the site back on line. 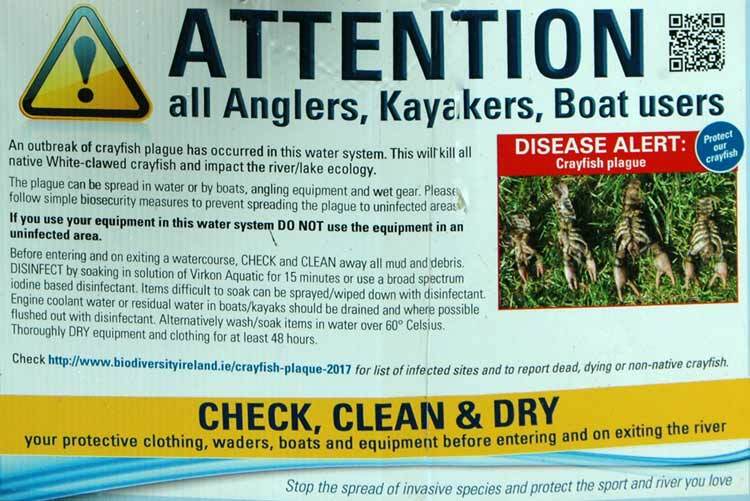 (So much for Tipperary Tourism). This proves yet again the amounts of money being wasted by Tipperary Co. Council Officials, supported by our locally elected and paid Councillors. We are not aware of exactly how much tax payer’s money was wasted in any buy-back arrangement with Mardukas Technologies Limited, for the site ‘thurles.ie’. We are aware however that the site, together with the build and administration costs, over the years prior to the purchase by Mardukas, exceeded well in excess of €10,000. Two Questions; (1) Was the site content deleted when the new purchasers took possession? (2) Was the site ever backed up by Tipp Co.Co.? If No is the answer to both questions, expect another hike in your property tax this year. Hopefully, those resident in Thurles will also get the opportunity to formally give their ‘sign of approval’ to this new signage, in the interest of public consultation you understand; guaranteed by Tipperary Co. Council and our local elected representatives. After all councillors have confirmed that same was paid for by that recent increase in our property tax. One wonders did they spend it all on our signage. Well-known Irish painter, Richard Thomas Moynan (27th April 1856-10th April 1906) was born in Dublin at No.1 Eldon Terrace, off the South Circular Road. He was the fourth of eight children; three sons and five daughters, born to Mr Richard Moynan (Sr.) and his wife Harriet (nee Nobel and daughter of Arthur Nobel, a Church of Ireland clergyman). The father of Richard Moynan (Jr.) held a managerial position with the fabric importers Ferrier, Pollock and Company, who had registered offices at No. 59 William Street, Dublin 2.